The event drew a crowd of more than 200 students, and according to Ashley Sherman, TCU YAF secretary at the time, once all seats were filled, students began sitting on the floor and in the doorway in order to hear West speak. Many members of the crowd were West supporters, but TCU 360, the university’s student newspaper, reported that more than 50 Better Together protesters were in attendance. West, who has always been openly opinionated when it comes to radical Islamic terrorism, stood firm in his convictions throughout his speech. “I think Rep. Allen West did an excellent job differentiating between Islam and Radical Jihad. West laid out why Radical Islamic Terrorism is a great threat to this country and world and shouldn’t be ignored. That’s where I think Better Together protestors were mistaken. 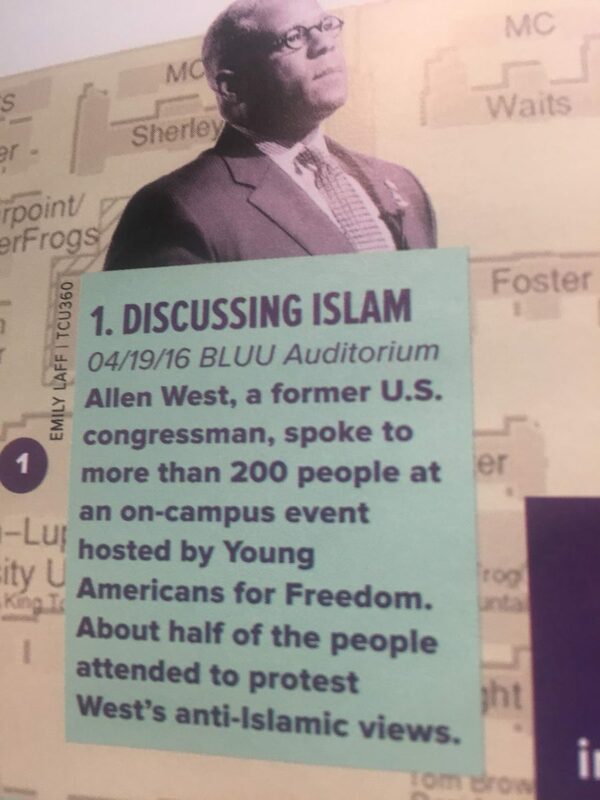 Allen West wants to let everyone know the truth of Radical Islamic Terrorism and how it should not be labeled as the same as Islam,” TCU College Republicans president Matt VanHyfte told TheDC. “It was incredibly disappointing to read the University’s blatant attempt at devaluing the tremendous success TCU YAF had in bringing Lt. Allen West to campus. The suggestion that half of those in attendance were participating in a protest, is a factually inaccurate attempt to take away from our chapter’s success, given the fact that the room was packed beyond full capacity with students, faculty, and members of the Fort Worth community, in the aisles and hallways to hear from and meet West,” Sherman explained. 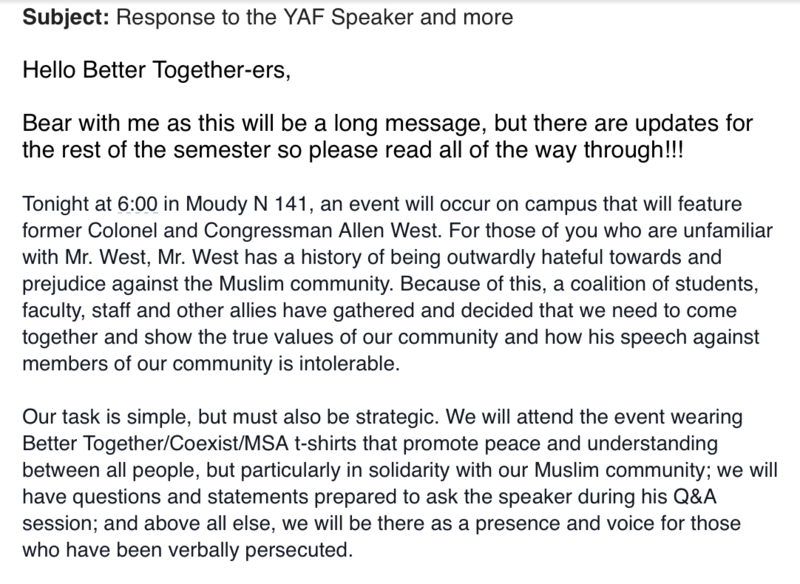 The same administrator also informed the SLU students responsible for organizing the lecture that the words “radical Islam” could not be used on any advertisements for the event. Despite the criticism West has received, students, supporters and Young Americas Foundation will continue to promote and spread his message. “YAF activists will not back down in the face of challenges from politically correct campus bureaucrats,” YAF’s website declares.